This is one of the cards that we made this year in my Christmas stamp camp. Fairly easy to make. 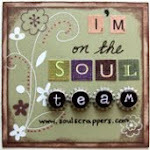 All products used are Stampin Up. Thanks for looking. Just wanted you to know that your project will appear on the Late Night Stampers blog finds of the day for Oct. 26. Not a member? Check out http://groups.yahoo.com/group/stampinuplnstampers/.